If you’ve ever wondered how you can get more relaxation from your meditations then this will help. I’m going to share 5 of my favorite meditation and relaxation tips to help your mind, body, and spirit, feel refreshed and rejuvenated. While meditation by itself can help to relax the mind and body, sometimes it just isn’t enough. Those times are usually the ones when you feel like you’re about to melt-down or explode because of the pressure you are experiencing. At these times sitting down and meditating is probably the least effective thing you can do. If you have had an emotionally challenging day or time then before you try and meditate do something to get your heart-rate up for 10 to 15 minutes. You don’t need to go crazy but even going for a brisk walk, jogging, dancing to your favorite music, or even just shaking your body, will help to get your energy moving in a productive way. Just by moving your body for a few minutes helps to start releasing tension from your muscles so that you can relax deeper in meditation. 2. Say no more often. All too often we take on things that are not in the best interests of our health and well-being. Before you load yourself up with any more tasks or projects ask yourself if it’s something you want to do, or is it something you feel obliged to do? If you feel obliged, then you’re not doing yourself or the other person a favor by saying yes, when you mean no. Have the courage to say no to someone the next time you don’t want to do something and then you’ll find you’ll have a ton more energy left to keep for yourself. Don’t forget that every time you say no to others you are saying yes to yourself. It always fascinates me that people continue to neglect the one thing that should be the most important to them – their physical body. If you don’t look after it, it will break down, and then even meditation won’t help. It’s 10x harder to meditate when you are unwell than it is when you are healthy. By keeping your body happy and healthy you are automatically giving yourself the best opportunity to enjoy deeply relaxing meditations. The simplest way I know to take care of my body is to make it a priority everyday. This means that I eat healthy, sleep well, keep hydrated and keep my stress levels under control. 4. Take care of your mind. It may sound strange but we really do need to take care of our mind. From the moment we wake up in the morning until we go to sleep at night our mind is constantly on-the-go. Scientists estimate that we have an average of 60,000 thoughts per day, which is a lot of energy running around in our head and body. Not all these thoughts are positive and uplifting thoughts either. Many of them are stressful, negative, or anxious thoughts, and cause our body to become stressed and tense. The best way I know to take care of my mind is to nourish it with healthy, happy and enlightening thoughts. So try cutting out listening to the news, gossiping and talking to people who drain you. Instead, read self-development books, listen to life-transforming podcasts and hang-around people who inspire you to be better. 5. Keep coming back to the present. It’s so easy to get caught up in the hustle and bustle of daily life. Rushing around madly trying to keep up with our to-do lists, or even just trying to keep on top of things each day is sometimes easier said than done. It’s the rushing part that has the potential to cause us harm. From being more accident prone and making mistakes, to being less productive and more stressed, when we forget to slow down and be present then it can be impossible to relax. Just by taking a few mindful moments every 60 or 90 minutes during the day, you’ll not only feel instantly more centered and energized, you’ll also be helping to keep stress at bay. 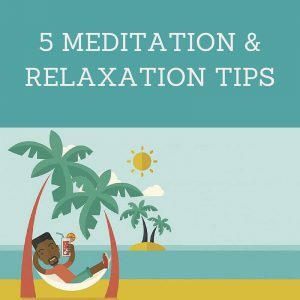 These are just a few of my very best tips on how to get the most relaxation out of your meditations and your day. I hope this helped and remember that to be relaxed is our natural state and it’s only when we demand unnatural things from ourselves that we forget to enjoy it.